From left: Sarah Hobson, Chair of IANE (Inter-Provincial Association on Native Employment), Westman chapter, scholarship recipients Purvis Cromarty and Rachel Robertson, and Gervan Fearon, president of Brandon University. Brandon University students have once again collected all available scholarships under the IANE bursary program. 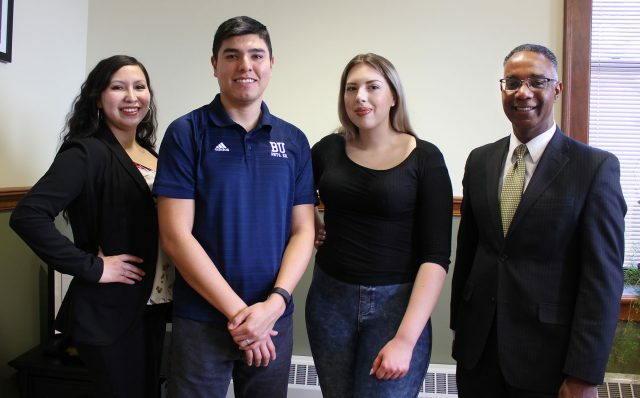 Now in their third year, the bursaries are presented annually to post-secondary students of Aboriginal descent in Westman, by the Westman chapter of the Inter-provincial Association of Native Employment. Last year and the year before, both recipients each year were BU students. This year, the awards expanded to three bursaries, and all three winners were once again BU students. This year’s IANE bursaries go to BU students Purvis Cromarty, Jeremy Monias, and Rachel Robertson. 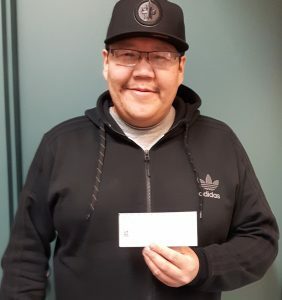 Cromarty, who is from Norway House Cree Nation, is currently in his final year of the Bachelor of Education (After Degree) program and also has an undergraduate degree in Physical Education studies with a major in Physical Education and a minor in Geography. He says he enjoys working with children, and that is why he wanted to become a teacher. Upon graduation, he plans on teaching in his home community. Monias, from the Garden Hill First Nation in northern Manitoba, is currently in his third year of a Bachelor of Arts degree. He is majoring in Business Administration and will graduate next year. He says his motivation comes from my family. He has two girls: 11-year-old Illeanna, and Jenae, who will turn 2 in March this year. He also loves hockey, and says he is proud to watch his daughter play hockey as well. He also says he could not have done any of this without his fiancé Elilah, who constantly supports him. Robertson is a 24-year-old third-year student from Keeseekoowenin First Nation, and she says she is proud of her Indigenous ancestry. Moving to Brandon, she says she saw how some of the urban Indigenous population struggled with living in a city, including a lack of housing, community support, and jobs that pertain to Indigenous needs. At BU, she is majoring in Native Studies and minoring in Sociology. She says her passion for the social issues that Indigenous people face and her dream of becoming an advocate for Indigenous people will lead her to take her law school with a focus in Aboriginal Law.